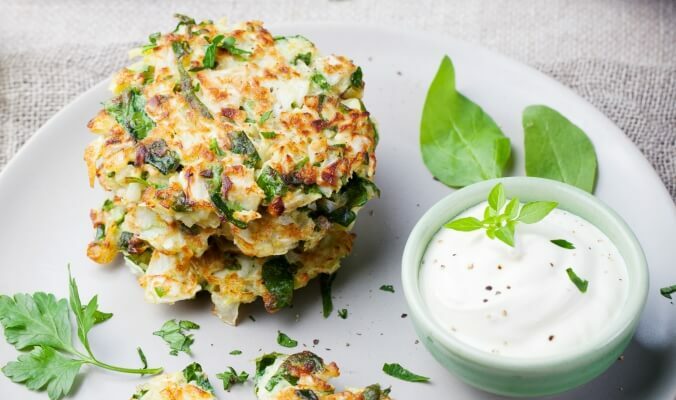 You have to try these delicious and healthy Zucchini fritters from the chefs at Canyon Ranch Tucson, a member of Healing Hotels of the World. In a large sauté pan, over medium heat, sauté onion and garlic in olive oil until onion is translucent. Next, add zucchini and cook until the zucchini just begins to soften. Then, remove from heat and place in a colander to drain and cool. Add parsley, oregano, salt and pepper to zucchini mixture and stir to mix evenly. In a large bowl, using an electric mixer, beat the egg until it is frothy. Next, stir in milk and buttermilk. Add flour, salt and baking powder and stir until just mixed. After that, add zucchini mixture and stir until well combined. Heat a large nonstick sauté pan and spray with canola oil spray. Using ¼ cup measure, scoop zucchini mixture onto the pan and then flatten with a spatula. Then, sauté fritters until golden brown and crispy on each side. In a small saucepot, over medium heat, bring tomatoes, vinegar, water, sugar, olives, basil, salt and pepper to a slow simmer. Then, cook until mixture thickens. Cool. Add cheese to relish and mix thoroughly. Serve 3 fritters with 2 tablespoons Tomato and Feta Relish on each fritter. Lastly, sprinkle chopped pine nuts over the top of the fritters.